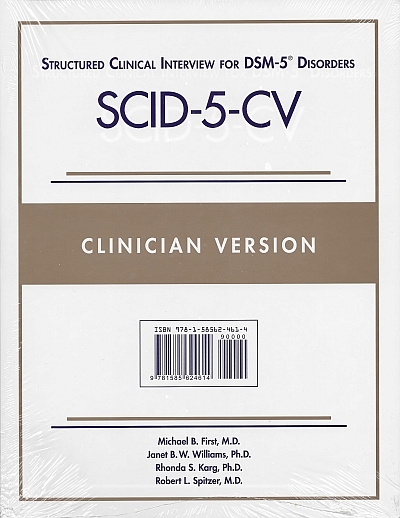 The Structured Clinical Interview for DSM-5, Clinician Version (SCID-5-CV), is a semi-structured interview guide for making DSM-5 diagnoses. It is administered by a clinician or a trained mental health professional that is familiar with DSM-5 classification and diagnostic criteria. The SCID-5-CV comes in a set of five one-time-use booklets. • To ensure that all of the major DSM-5 diagnoses are systematically evaluated in adults. For example, the SCID is often used in clinical intake procedures or in comprehensive forensic diagnostic evaluation. • To characterize a study population in terms of current psychiatric diagnoses. For example, the diagnostic data that have been obtained using the SCID interview can be utilized by researchers, practitioners, policy makers, and the general public that are interested in prevalence and incidence estimates of psychiatric disorders among certain populations (e.g., depression in patients with diabetes). • To improve interviewing skills of students in the mental health professions, including psychiatry, psychology, psychiatric social work, and psychiatric nursing. For example, the SCID can provide trainees with a repertoire of useful questions to elicit information from a patient as the basis for making diagnostic judgments. Through repeated administrations of the SCID, students will become familiar with the DSM-5 criteria and at the same time will incorporate useful questions into their own interviewing repertoire. The SCID-5-CV is an abridged and reformatted version of the SCID-5-RV for use by clinicians that covers the diagnoses most commonly seen in clinical settings. Despite the “clinician” designation, the SCID-5-CV can be used in research settings as long as the disorders of particular interest to the researcher are among those included in the SCID-5-CV. Screening questions are provided for the diagnoses that are included in their entirety in SCID-5-RV but have been left out of the SCID-5-CV. A unique and valuable tool, the SCID-5-CV is used to assess and record DSM-5 diagnostic decisions. It will guide the clinician step by step through diagnostic decisions using the DSM-5 criteria, which are included in an abridged format. A SET containing this package of five plus a User's Guide .